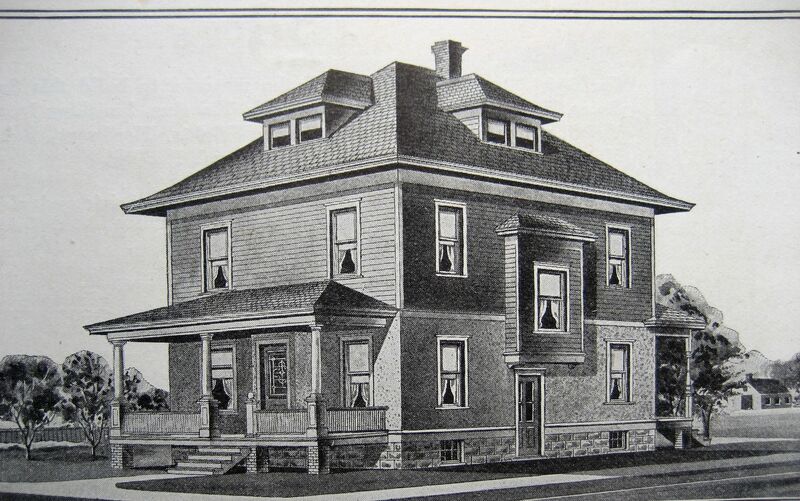 In the early 1900s, you could sit down with a Sears Roebuck catalog and order a complete house. 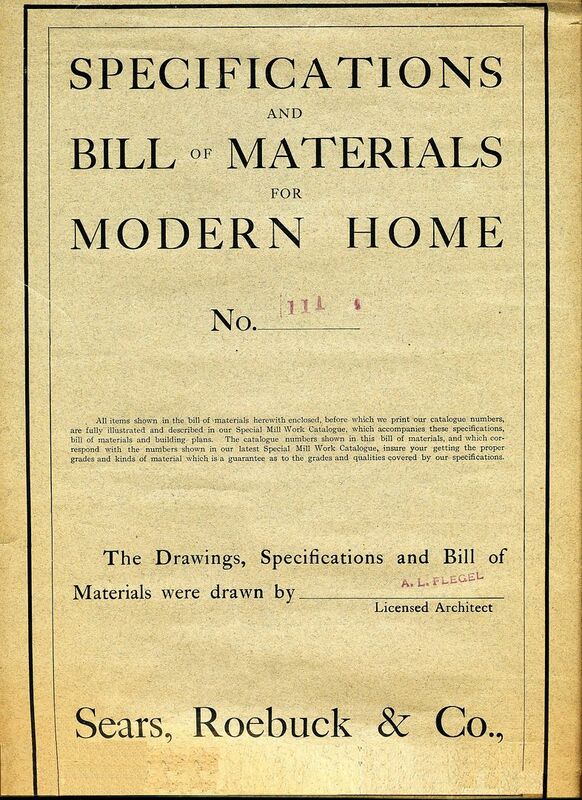 After selecting the perfect house, buyers were asked to send in a $1 “good faith” deposit to Sears Roebuck and by return mail, the hopeful homeowners receive a Bill of Materials List and full set of blueprints. If you liked what you saw, you’d send in the balance of your money, and that $1 deposit was credited toward the final purchase price. A few weeks after the order was placed, a boxcar containing 12,000 pieces of house would arrive at a nearby train depot. In anticipation of our big move, I’ve started going through my papers and boxes and sorting things out. 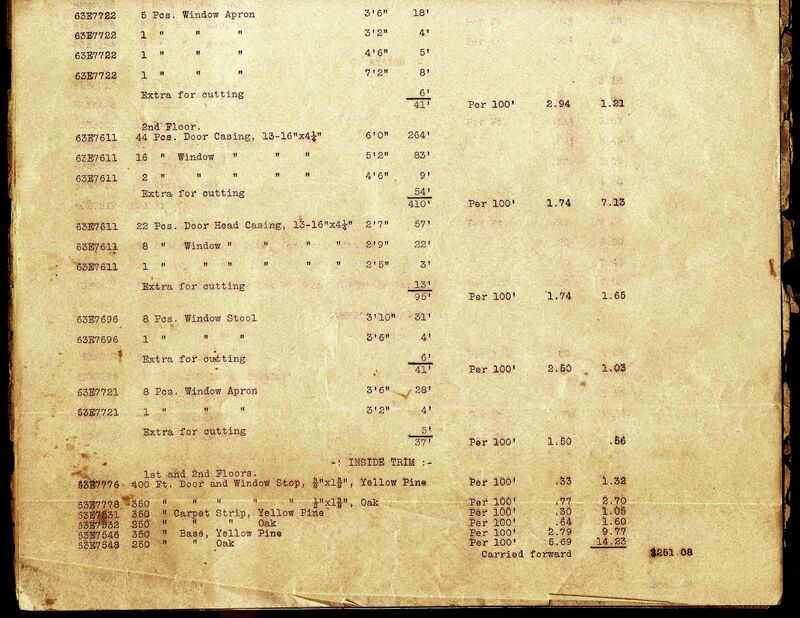 I found two of these early 1910s original “Bill of Materials” list. One went to a friend that owns a Sears Modern Home #111; the other went into a pile of items that I have donated to Old Dominion University Library’s “Special Collections” and is now known as “The Papers of Rosemary Thornton” (I love that). The super-heated attic in my 1925 house was not a proper repository for these priceless, precious old documents and I’m gladdened they’ve gone to better places. And I’m also glad to know that - thanks to modern technology - the originals will be preserved forever and the electronic images of those originals can now be shared with a larger audience through this website (which now gets 500 hits per day). Look closely at these pages below, and you’ll see a fascinating piece of American history. This document, together with a full set of blueprints, could be yours for $1. If you liked what you saw, Sears credited the $1 to your final purchase price. This was one of two "Building Materials" lists that I found whilst cleaning my attic. 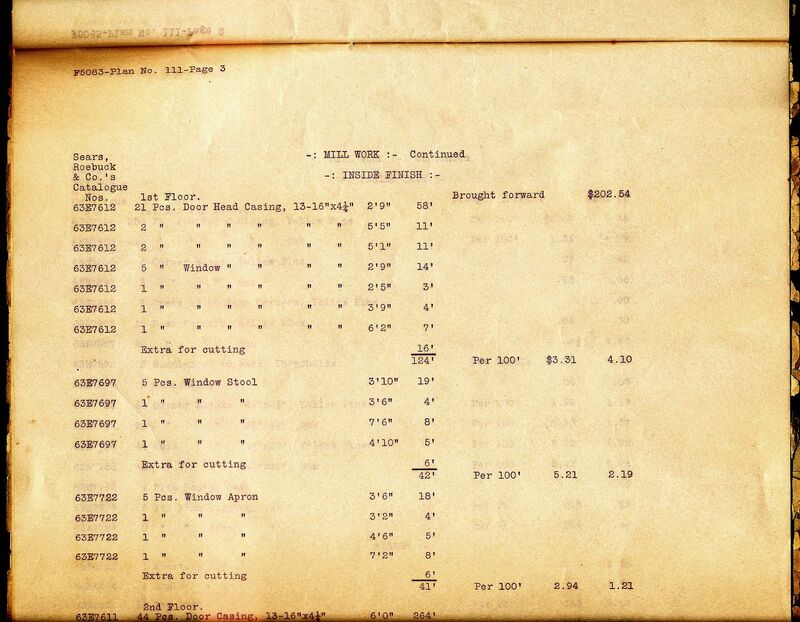 These pages were all hand typed, one by one. The pages of this 100-year old document contain an incredible piece of America's architectural history. Below is a picture of Modern Home #111, The Sears Chelsea. To read another article on Sears Homes, click here. Thanks so much for sending me this piece of American History. It will forever stay with the Colonial Heights Chelsea. I own two Sears Modern Homes. Both from the Honor Bilt lines, a Chelsea and a Cornell. I adore my homes and their history during the Industrial Age. I am in dire need of the building plan and material list associated with Chelsea 111. Last March 28th we had a catastrophic fire and lost everything, but the frame and outside walls. My insurance company is contesting the building materials and is quoting MDF molding, hollow core doors and the cheapest oak floors on the market today. I am devastated and beside myself with the loss and want to restore my gorgeous and beloved Chelsea girl. I live in Massachusetts and have been searching everywhere to determine if my home is considered historic. Please help me with an electronic copy of the specifications and building material list, as well as if these homes are historic, so I can present to my insurance carrier. My Chelsea 111 had to be gutted and I have subsequently found all sorts of marked/stamped boards. I also have the original toilet tank with an odd stamp on the back which I would like to verify as coming from Sears. My neighborhood is a cluster of Sears homes which I never realized until the last month. I live less than a mile from a train station, so it all makes sense. Please if possible, email me with any building information about the Chelsea 111. It would be my honor to give you a tour of my neighborhood and my gutted Chelsea for you to see it’s construction which is not possible in a complete home. Please advise. Endless Entertainment - From an Old Vintage Catalog Is My House a Sears House? The Nine Easy Signs.